Why Take Probiotics? In Order to Be Healthy! Find out how. Why take probiotics? The short answer is, "To be healthy." As the health benefits page shows, probiotics positively influence many health conditions by primarily targeting your digestion and immune systems. These systems then affect you entire body, including the genes you express! Researchers and medical practitioners are beginning to realize that the microbes within us have such a significant influence on us that it is better to have the balance of microbes in favor of the beneficial ones and not the pathogenic ones. As a matter of fact, especially in the gastrointestinal tract, disease is associated with having less variety in the microbiota. So to be healthy, you need a diverse group of microbes, with beneficial ones in control. "Taking" probiotics doesn't have to mean taking a probiotic supplement, although you'll find that in today's society, doing that may provide a cushion to be well. Probiotics, or at least beneficial bacteria and yeasts, are available in fermented foods and drinks, and those have been consumed by people for thousands of years! Even today, most cultures in the world, even in the poorest nations, consume fermented foodstuffs. You can find out more about where to get probiotics here. The Answers to "Why Take Probiotics?" Here are a few of the proven amazing effects and health benefits of probiotics. There are many, many more specific benefits of probiotics and more are being discovered with emerging research! Why take probiotics? To be healthy, of course! Are you convinced yet? You can learn more from my book. 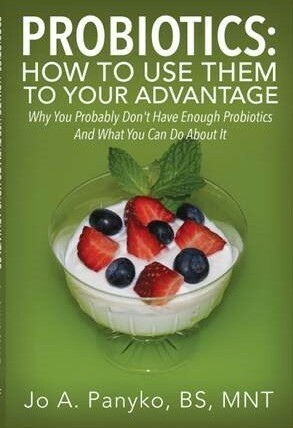 My book, Probiotics: How to Use Them to Your Advantage, explains why you need probiotics, why you probably do not have enough and what to do about it. Learn more here. This page explains how the effects of probiotics happen.